New Delhi: Indian scientists are working on a device to detect tuberculosis (TB) in the early stage of the disease by trapping human breath in air-tight plastic jars. Late detection of this infectious illness means most patients are treated at advanced stage. Available tests take days, sometimes weeks, to show results. Early diagnosis and timely treatment could potentially save lives, reduce medical costs and prevent the spread of infection. On Monday, the ICGEB research team led by Virander Chauhan, 62, and Rajan Nanda, 32, received a grant of $950,000 from the Bill and Melinda Gates Foundation and Grand Challenges Canada, a non-profit organization funded by Canada’s foreign aid programme, to take the device to the next stage of development. The scientists will collaborate with Next Dimension Technologies, a California-based sensor application design firm, to build a hand-held, battery-powered sensor to track so-called bio-markers in the breath, Grand Challenges Canada said in a statement. In 2008, Nanda and his team were among 100 recipients to get the $100,000 Grand Challenges exploration grant from the Gates Foundation to start work on building the electric nose. The foundation invests millions of dollars to nurse off-beat ideas for community health, among them fighting malaria with microwave heat and smelly socks. Peter A. Singer, Grand Challenges Canada’s chief executive officer, said the idea behind investing in the Indian project is to foster cross-border collaborative partnerships in low and middle-income countries. “It bridges the weak links in the tuberculosis diagnosis chain with a low-cost device, which is a prelude to any treatment," Singer said in an interview. At home, for lead scientist Nanda, it’s about finding a remedy to a disease that afflicts hundreds of thousands of people in the country, mostly the poor and malnourished who have little immunity and few resources to fight it. At least 3,60,000 people die of pulmonary tuberculosis in India every year. Worldwide, the disease killed 1.4 million people in 2010, according to the World Health Organization. The new technology is non-invasive, said Nanda, and fashioned after a breathalyser. It rests on the principle that people have different patterns of breath. The scientists claim they have been able to detect different stages of tuberculosis by analysing so-called bio-signatures of breath. For sample collection, patients and healthy subjects are asked to exhale three times— an equivalent of 150 millilitres of breath air—into a specialized container, widely used in the perfume industry. The trapped air is then collected inside pencil-thin steel pipes with the push of a plunger attached at one end of the container. At ICGEB’s sprawling campus in south Delhi, Nanda demonstrates the newest innovation—a mass of tangled wires, an electric oven, a computer. As the steel pipes with the trapped human breath go into the oven, he says the breath molecules separate on heating, as it slowly passes through a 30 metre copper loop. The mass spectrometer can analyse the breaths in about 45 minutes. Existing tests take much longer—a sputum smear takes two days, sputum culture two weeks and a tuberculin skin test 72 hours. The researchers are currently collecting breath samples at the city’s government-run Lala Ram Swarup Institute of Tuberculosis and Respiratory Diseases to further validate their research. It already has a bank of 855 samples; the scientists will now expand the collection drive to Chennai, Kolkata and Mumbai. At the Lala Ram Swarup institute, some 400 patients seek treatment every day—many of them rickshaw pullers, carpenters and masons. 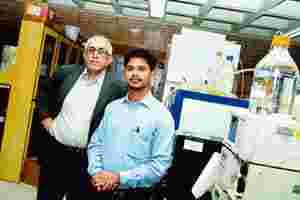 Here, Khalid Muzaffar Bandey, one of the four scientists, goes on his daily rounds to gather “aerosol breaths". With a protection mask over his face, he asks Rekha Singh, a 45-year-old migrant worker from Uttar Pradesh’s Etah district, to breathe into the plastic container. The mattress maker has been suffering from fever, breathlessness and bouts of cough for two months, sometimes throwing up blood, she says. Her neighbour had died of TB six years ago. The fourth scientist is 27-year-old Ankur Varshney. Rupak Singla, head of pulmonary medicine at Lala Ram Swarup Institute, says the sensitivity of the current diagnostic tools are low, and can miss many TB cases. “The new research, if successful, could help to diagnose more cases early and reliably among TB suspects," Singla said. The electronic nose project was initially supported by the government’s biotechnology department, and is an example of cross-border collaborative innovations for community health. In India, most scientists are struggling to find such a platform. Maharaj K. Bhan, secretary of biotechnology, said there’s a “connectivity" problem in India in sharing resources for innovation, connecting science with technology and innovation with social needs. “We need to create processes and institutional framework to build connectivity with academia and industry," Bhan said.